eBenefits. This VA website provides access to information on benefits, healthcare, education, and jobs. Once you are registered, you will find this site can be useful for managing your VA benefits, too. VA Benefit Eligibility Matrix. This matrix, created by current and former members of the Veterans Benefits Administration, shows you benefits for which you may be eligible, all based on a favorable decision for a VA benefit and/or based on special circumstances. Claims Representative. Ventura County Veterans Service Office (VSO) has VA certified claims representatives to assist you with your VA claim. Here is a link for their field office locations. For more information, call their office in Ventura at 805-477-5155. VSO. Click here to learn how to purchase this license from the DMV. Veterans ID Card. On November 29, 2017, the Department of Veterans Affairs (VA) provided another option for veterans to get a veterans identification card…for free. Click here to learn more and to apply online for your card. Scams Targeting Veterans. AARP and the U.S. Postal Inspection Service have launched Operation Protect Veterans to help raise awareness of common scams targeting veterans. Such scams include upfront cash payments to get disability benefits, paying to access military records, discount offers for veterans that don’t exist, and more. College Comparison Tool. The VA has a website tool that can assist veterans to determine their educational GI Bill benefits based upon a specific school. Enter the school name to find out tuition, housing and books dollar amount covered by the different GI Bill educational benefits. Forever GI Bill Updates. As of August 1, 2018, a number of changes went into effect. Many of these changes increase the amount of the entitlements. Click here for a complete list of the changes, and you can also click here to download the fact sheet containing those changes. CalVet Fee Waiver. The California College Tuition Fee Waiver benefits the spouse and children of U.S. Veterans. Students meeting eligibility criteria may get their college fees waived if they attend any State of California Community College, California State University, or University of California campus. This program does not cover the expense of books, parking or room and board. Check here to see if dependents of veterans may be eligible. Scholarship Programs. This VC Star article provides information on applying for scholarships through various veterans’ organizations, such as the Military Officers of America Association (MOAA) Scholarship Fund and the Veterans of Foreign Wars (VFW) scholarship programs – The Voice of Democracy and Patriot’s Pen. VA Job Seekers Website. Search for jobs using the VA’s employment website that includes federal jobs posted on USA Jobs. Careers and Internships at IAVA. Iraq and Afghanistan Veterans of America (IAVA) offers job and internship opportunities, and they are always looking for both civilian and veteran volunteers to help further their mission of connecting, uniting, and empowering post-9/11 veterans. IAVA is headquartered in New York City and has an office in Washington, D.C.
Resume Template. Time.com provides a resume design and word template you can download to make your resume stand out. LinkedIn Profile. Time.com provides LinkedIn profile tips and an example of what employers and recruiters look for in the profiles of potential employees. Social Media and Your Job Search. Are you wondering if you need to remove inappropriate posts from your social media accounts? Here is an informative article from the Business News Daily that describes what hiring managers are looking for when they view your social profile. Free Premium Job Seeker LinkedIn Subscription. The world’s largest professional network is stepping up for Veterans. Sign up now for a free one-year Job Seeker subscription. Signing up provides several upgraded features like better access into who views your profile and free access to Lynda.com training for one year. Your LinkedIn profile must include your military career for veteran verification. Lynda.com training is an online training program that is available to veterans at no cost through LinkedIn. LinkedIn does not require a credit card to sign up. Lynda.com will be available for a year. When a Lynda course is completed it will ask if you want your certificate displayed on your LinkedIn profile. This is an easy way to improve your job skills. The Federal Virtual Training Environment (FedVTE) provides free online access for U.S. Veterans to cyber-security training to help the workforce maintain expertise and foster operational readiness. Transition GPS Training. Learn how to align your goals with your future career. This standalone Joint Knowledge Online course is available for veterans and family members. Courseware includes lessons on AN employment workshop, federal employment and entrepreneur track self-employment. VA Greater Los Angeles Healthcare System. This is the VA’s regional office for Ventura County’s VA services. This website provides their address, phone number, additional information on services and directions to the West LA campus and Sepulveda Ambulatory Care facility. VA Oxnard Community-Based Outpatient Clinic. VA Healthcare services available include: Primary Care, Women’s Health, Dietetics (Dietician), Physical Therapy, Mental Health, Clinical Pharmacy Specialists limited to anticoagulation and diabetic case management, Telehealth (mental health, retinal and audiology), Laboratory, and Radiology. This website provides the Oxnard Community-Based Outpatient Clinic location and additional information. Dental Care. The Conejo Free Clinic’s new state-of-the-art dental clinic is now open in Thousand Oaks and available for veterans. Dental care will be provided without charge by an all-volunteer team of dentists and dental assistants. Veterans and their families must meet the 200 percent California federal poverty income guidelines determined by total household size. Veterans and their families can take advantage of all Conejo Free Clinic services by appointment. Call 805-497-3575, ext. 0. 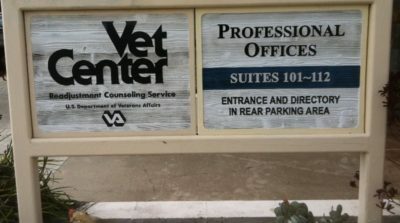 Vet Center – Ventura. The VA Vet Center in Ventura provides support to combat veterans with counseling and support groups. To learn more or schedule an appointment, call 805-585-1860. PTSD Resources. U.S. Department of Veterans Affairs has dedicated a website for veterans to connect with others who are dealing with issues stemming from military combat and service. You can search for experiences similar to yours and connect with other veterans at Make The Connection. The Vet Center offers readjustment counseling at no cost. National Center for PTSD: Help for Family and Friends – The National Center for PTSD provides information about the effects of Veterans’ trauma on their families, children, relationships, and communities, as well as resources and support to help Veterans and their family members and friends to respond and cope with those effects. Coaching Into Care is a national telephone service of the VA which aims to educate, support, and empower family members and friends who are seeking care or services for a Veteran. The goal is to help Veterans, their family members, and other loved ones find the appropriate services at their local VA facilities and/or in their community. We also provide coaching to family and friends of Veterans who see that a Veteran in their life may be having difficulty adjusting to civilian life. VA Cemetery Eligibility. The Department of Veterans Affairs (VA) implemented the pre-need burial eligibility determination program to assist anyone who would like to know if they are eligible for burial in a VA national cemetery. VA is promoting pre-need eligibility determinations to encourage Veterans and their eligible family members to plan in advance to use VA burial benefits that Veterans have earned through their military service. Planning in advance for a Veteran’s or loved-one’s final resting place can eliminate unnecessary delays and reduce stress on a family at a difficult time. Check here to see eligible form. VA Survivor Benefits and Services. The Office of Survivors Assistance (OSA) is a Department of Veterans Affairs (VA) program designed to provide dedicated and comprehensive support to Survivors and dependents of deceased Veterans and members of the Armed Services. OSA hopes that Survivors and dependents, Veterans, their families, caregivers and others will become more knowledgeable about the benefits and services offered by VA to eligible Survivors and dependents, and take the next steps to apply, if deemed eligible. VA Survivor Benefits Brief. GCVF and the Military Order of the Purple Heart (MOPH) Chapter 750 were proud to co-host the VA Survivor Benefits Brief on November 7, 2017. The speaker was Moira Flanders, RADM USN (ret.) and Director of the VA Office of Survivors Assistance. She provided valuable information for family members of veterans to receive the most benefits possible when they lose their loved one. She also discussed the importance of veterans to prepare ahead of time by completing a pre-burial form. To hear the brief in its entirety, the podcast from the brief is below. A guide to the Veterans Memorials in Ventura County created by Tom Dotson as a service to our community and our veterans.